This article from Gigaom serves to further underscore The Tower of Babbling Things….Competitors battling each other over control of The Internet of Things over the means, methods and, most importantly, the dozens of competing data communication protocols. Honeywell has now entered the battle, realizing the a number of small, entrepreneurial startups are eroding their market for traditional thermostats. 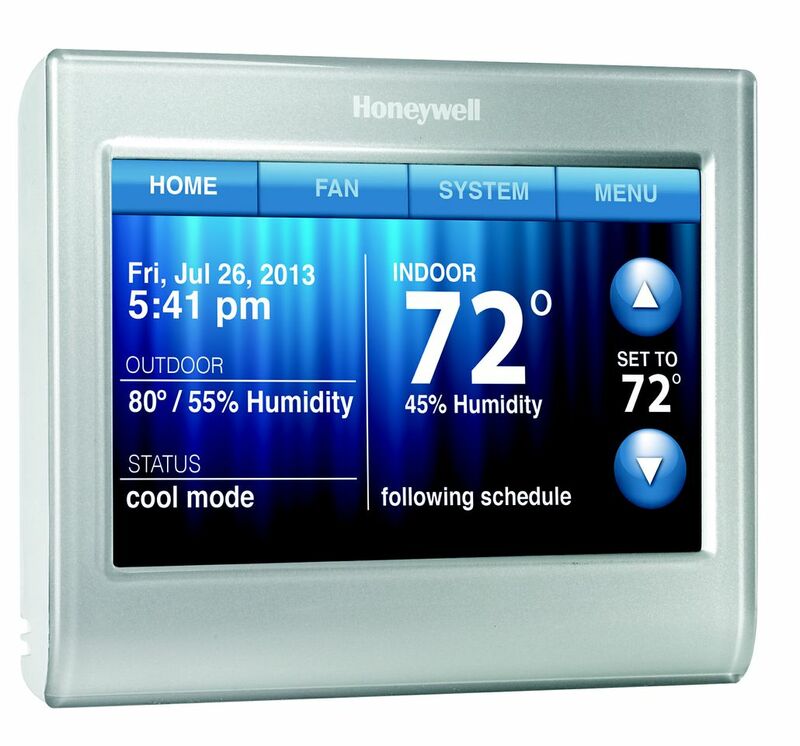 The glaring problem with Honeywell’s entry is the $250 price point. Previous to this development, Intel and others had promoted the concept of home tabletop display consoles for energy efficiency management. The display console concept is now officially dead, as reported in the Gigaom post. Recently, Gigaom also showcased three competing home automation systems, all of which were “closed” proprietary systems. SUMMARY: In the face of growing competition from startups, Honeywell has launched a Wi-Fi-connected, smart thermostat, and the device may one day control more than just the heating and cooling systems. The battle to control how people heat and cool their homes is heating up in a way that is reminiscent of the fight over which company gets to lord over the home’s media and entertainment systems. Honeywell recently launched a fancy $249 Wi-Fi thermostat and an online energysavings calculator that aim to re-invent the company’s long-standing product line, and compete with younger, nimble upstarts like Nest and Radio Thermostat Company of America. Some of these startups are moving aggressively — despite only launching the learning thermostat in 2011, Nest has gotten it into big retail chains such as Lowe’s and Apple’s online store. But temperature control isn’t what makes the technology development of these so-called smart thermostats interesting to watch. With more built-in sensors, software and wireless communications, these devices could become the brains of home energy networks, which will include not only the heating and cooling systems but also appliances and other energy consuming gizmos. The assumption here is that consumers will want greater control and automation of their energy use in order to keep utility bills in check. But how much time they are willing to spend tinkering with various settings and monitoring their energy use is still a big question. We know that high-end energy dashboards were essentially flops. Doling out the same advice when consumers are paying their utility bills, on the other hand, seems to work better because you are getting their attention when they are about to fork over part of their earnings to keep their homes lit and comfortable. But thermostats are no longer the only devices that are vying for control. With the emergence of rooftop solar panels and batteries to store home-grown energy, we are seeing control systems emerge that are designed to manage all of the energy created and consumed for the home. The space for home energy control could be a tremendous market and has no dominant players so far. It’s like the early days when consumer electronics makers were trying to figure out whether it’d be the game console, TV, set-top box, computer or some other stand-alone devices that will the hub to connect the living room and deliver entertainment and other content throughout the house. After all these years, that fight remains unsettled. Honeywell introduced the Wi-Fi Smart Thermostat just over a year after suing Nestover patent infringement in February 2011. The lawsuit remains in place, though it’son hold at Nest’s request. Honeywell is using technology it previously engineered for industrial-grade thermostats for the new model, said Mike Hoppe, senior product marketing manager. The Wi-Fi thermostat lets homeowners key in daily temperature preferences and program their heating and cooling settings remotely by smart phones. The device shows indoor and outdoor temperatures and alerts its owner when the home becomes too hot or cold and a new temperature setting might be needed. It also notifies the homeowner when the thermostat’s Wi-Fi connection is broken or when the home loses power. The core technology that Honeywell is proud of lies in the sensors and software that accurately reads the room temperature and communicates it promptly to the heater or air conditioning system, Hoppe said. The company says the accuracy margin is plus or minus 1 degree, unlike competing thermostats that could err as much as 4 degrees. The company is sticking with the traditional rectangular look rather than the round shape that has defined Nest’s thermostat even if Nest wasn’t the first to make it round. But since style is now an important feature, Honeywell’s take on that is to build in a palette of background colors for the thermostat’s touch screen — you can change it to match the color of the wall or your mood. The thermostat comes with a “utility mode” in which a homeowner would key in utility rates and other data. The device crunches those numbers to display a range of temperature choices, which let the homeowner decide whether to stick with the temperature she wants or to forego comfort in varying degrees in order to save money. There is a fair amount of data input in the initial set up. The thermostat asks you when you get up in the morning, when you go to sleep, what time you leave and return to your home and what temperatures would you want for all these blocks of time each day. There is also a vacation mode. 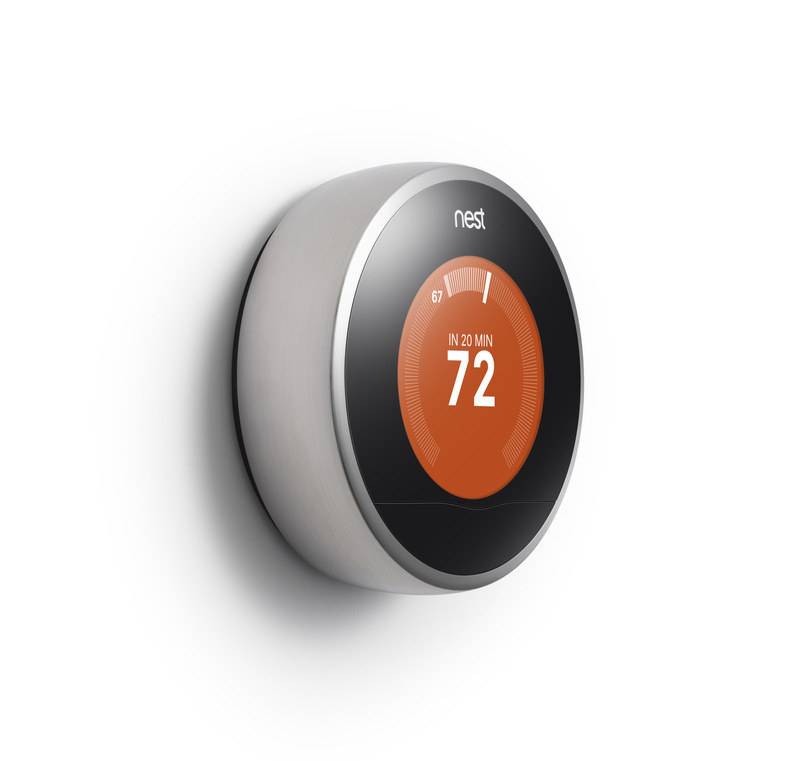 Honeywell makes it clear that its new offering is not a “learning thermostat” like Nest’s, which has a motion sensor and algorithms that are supposed to figure out a homeowner’s heating and cooling patterns and recommend changes to save energy. 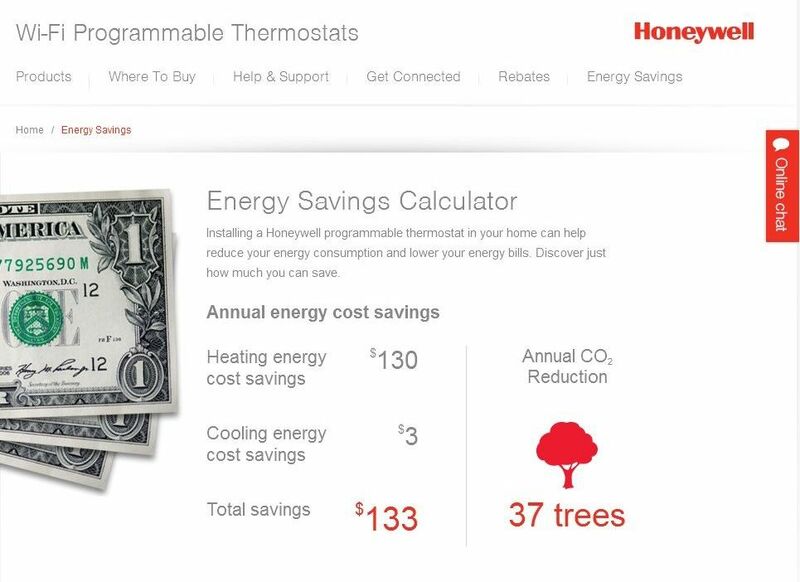 Honeywell contracted with GreenOhm to create the online energy savings calculator as a sales tool. With your zip code, information about your heating and cooling systems and your daily temperature preferences, the calculator can spit out an estimated annual monetary savings for using the new thermostat. You can also find out local utility rebates and other incentives for installing more intelligent thermostats. The Wi-Fi thermostat is designed to provide a much finer control of your home’s comfort. But it also requires more work to get it set up and put it to work. While it’s interesting to see manufacturers put some thought and fashion into the long-neglected device, the thermostat may just remain as a tool to create a comfortable home. People may not care much more about it beyond that.